VERONA, NY. – Puerto Rico earned yet another world champion this year as Alberto “Explosivo” Machado (19-0, 16 KOs) knocked out Jezreel “El Invisible” Corrales (22-2, 8 KOs) in the eighth round of a scheduled 12-round fight to become the WBA World Super Featherweight Champion at Turning Stone Resort Casino in Verona, N.Y. Along with Miguel Cotto and Jesus Rojas, Machado is the third boxer from Puerto Rico to win a world title within the past two months. In what was a hard-fought battle between two southpaws, Corrales earned an early advantage by being much quicker and skillful. The native of San Miguelito, Panama also landed hard overhand lefts repeatedly, eventually dropping Machado with that same punch in the fifth round. Little by little, though, Machado’s size and strength advantages began taking a toll on Corrales, who was hurt by a right hook in round six. Then, in the eighth round, Machado ended matters abruptly after the two exchanged left hands that had only one man hit the canvas: Corrales. After barely making the count, the fight was stopped at 2:18 of the eighth-round, making Machado, of San Juan, Puerto Rico, a world champion. At the time of the stoppage, the judges had Corrales winning with two scores of 68-64 and one score of 67-65. Former WBO World Junior Middleweight Champion Demetrius “Boo Boo” Andrade (25-0, 16 KOs) moved up to 160 pounds to shut out Alantez “Slyaza” Fox (23-1-1, 11 KOs) over 12 rounds to win by unanimous decision in tonight’s co-main event. In the opening round, Andrade set the mood for the fight by landing an overhand left that hurt Fox. For the next few rounds, Fox boxed cautiously, while Andrade controlled the pace of the bout by landing more left hands to the head and body and short right hooks on the inside. Andrade, who represented the United States in the 2008 Olympic games as a welterweight, was too skilled for Fox, who could not find the confidence nor the rhythm to land any significant offense. Though Andrade lost a point due to a slip that was ruled a knockdown in seventh round, the native of Providence, R.I. won with scores of 118-110, 118-109, and 116-111. Lamont Roach, Jr. (15-0, 16 KOs), the skilled super featherweight prospect of Washington D.C., won by first-round TKO in a scheduled 10-round lightweight fight after Luis Hinajosa (30-13, 17 KOs) of Santo Domingo, Dominican Republic, rolled and injured his ankle to end the fight at 2:04. Alex Rincon (3-0, 3 KOs) of Dallas, Texas scored an impressive second-round technical knockout victory against Steven Andrade (3-3, 2 KOs) of Cartersville, Ga. in a scheduled four-round middleweight bout. Luis Feliciano (4-0, 1 KOs) of Milwaukie, Wis. defeated Istvan Dernanecz (10-7, 7 KOs) of Budapest, Hungary via second-round technical knockout in a super lightweight fight initially scheduled for six-rounds. Super Featherweight prospect Ruben Villa (8-0, 4 KOs) of Salinas Mexico scored six-round unanimous decision victory against Agua Prieta, Mexico’s German Meraz (54-45-1, 34 KOs). Villa won with three scores of 60-54. In the first bout of the evening, Micheal Dutchover (6-0, 5 KOs) of Midland, Texas scored a fourth-round technical knockout victory against Anthony De Jesus Ruiz (2-4, 2 KOs) of San Luis Potosi, Mexico in a scheduled six-round lightweight fight. Corrales vs. Machado was a 12-round fight for the WBA Super World Super Featherweight Championship, held on Saturday, Oct. 21 at Turning Stone Resort Casino in Verona, New York. The main event was presented by Golden Boy Promotions in association with Cotto Promotions. 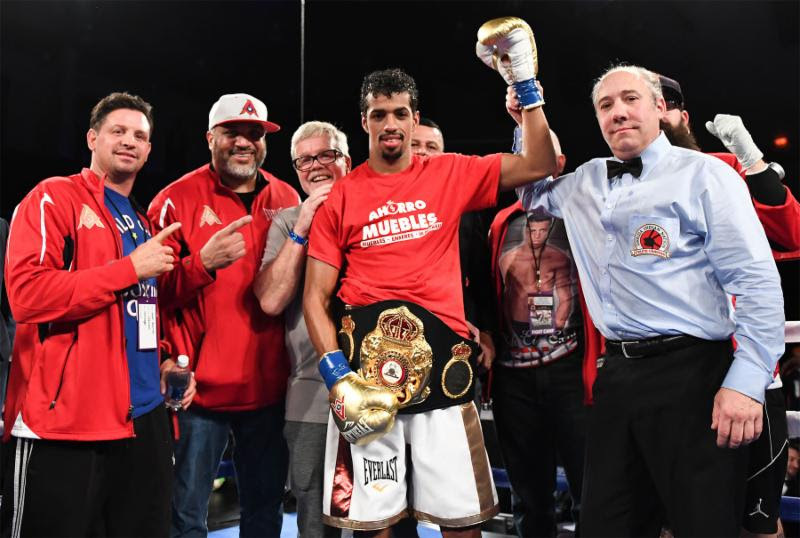 Andrade vs. Fox was presented by Banner Promotions, Joe DeGuardia’s Star Boxing and A-Team Promotions, in association with DiBella Entertainment. The event was sponsored by TECATE, “THE OFFICIAL BEER OF BOXING,” Casa Mexico Tequila, and Thor: Ragnarok, and was televised live on HBO Boxing After Dark.